Digital controls come as standard with all Dometic Air Conditioning systems. For Marine Air Systems equipment the principle choice is between the Passport and the Elite. 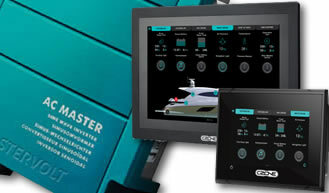 For Cruisair systems there is the SMX or the Q Logic. Larger chilled water systems will have separate chiller controls and have the possibility of fully networked systems. Further information can be found in the specification sheets or contact us for further advice and guidance. Marine air-conditioning systems need constant sea water flow through the condenser. The pumps on the specification sheet are all continuous rated and capable of dealing with seawater in the aggressive environment at the bottom of your boat. Please contact us for advice in selecting the right pump or pumps for the application. Separate circulation pumps can be provided or the more common pump package, the pump packages save considerable installation time by combining several of the necessary components on one convenient platform. The packages include a chilled-water pump, expansion tank, pump drain pan, dual-scale pressure gauge and fill assembly. The fill assembly includes a hose connection, ball valve, and pressure-reducing valve. Please contact us for advice in selecting the right pump package for the application. 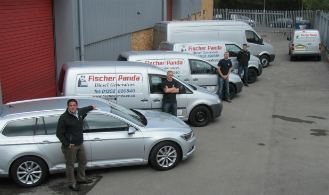 Fischer Panda can offer a range of "hidden" accessories ie insulated (supply air) duct-work, non-insulated (return air and ventilation) duct-work, splitters, Y-pieces, transition boxes, plenums, hose rings and adaptors, all made from vacuum-formed ABS plastic. For the air-conditioning system to work properly, it is essential that the supply and return grilles are sized as per the recommendations on the attached specification. Grilles are available in most hardwoods, we carry teak and cherry in stock, others are on longer deliveries of 4-6 weeks. For completely custom interiors, anodised aluminium grilles offer the most flexibility. Available in any size, shape or quantity, curved or straight, tall and thin or short and fat to any colour or finish. Supplied to order, painted aluminium grilles are 2-3 weeks delivery.